I have been meaning to write about this store for quite some time now. I happened to visit Zari Jaipur by chance when I was grocery shopping at a nearby mall. As a wedding blogger, anything lehenga related is always on my mind. No matter where I am or what I am preoccupied with, I just never fail to take out some time to explore new stores, new designers and of course great deals. Zari jaipur prewedding outfits is perfect for someone looking for cutesy lehengas in the under 20-30k budget. What I instantly loved about Zari Jaipur is that their stuff is not high end expensive. Zari jaipur prewedding outfits are good for smaller wedding functions, wedding guest look and some even drool-worthy sister of the bride/groom outfits. From the name, you might have guessed it right. Zari jaipur prewedding outfits is primarily a Jaipur (Rajasthan) based company. Most of their outfits have a lot of Rajasthani influence. 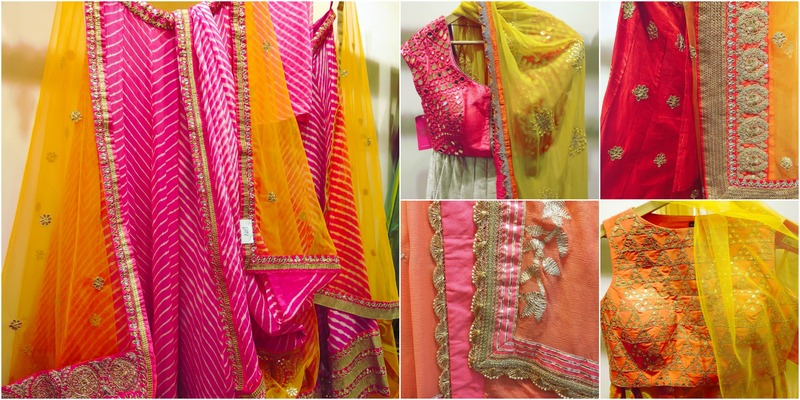 From leheriya to gota patti, mirror work…in corals, pinks and reds. It truly is a wedding store paradise for all those who love color in their lehengas/ethnic outfits. From crop top skirts, to fusion wear evening gowns, light weight lehengas, sarees and dress suits. Zari Jaipur prewedding outfits is a one stop shop for all your wedding wear needs. So if you are a bride to be looking for mehendi sangeet outfits, or just want a pretty prewedding photoshoot outfit, you will get a range of options here. My personal favorites are the prewedding function lehengas. They have an awesome collection. From colors, to prints, style..whether you like fit or flare, bright neon colors or bold colors, they have it all. I think this outfit is the perfect pick for a sister of a bride/groom. The color not too traditional, can be easily re-worn on multiple occasions even post the wedding. Love the contrasting colors with the over the top big latkans on the side. Can you guess the price ? What do Zari Jaipur Lehengas Cost? Crop top skirts are in the price range of 10-17k. The lightweight lehengas like the ones above are all 17k to less than 26k range. If you can’t afford a heavy duty designer ethnic outfit, then I think you should definitely give this place a shot. You might just find something you love. The leheriya lehenga sets are priced <18k and pure silk crop top skirts are starting as low as 10k. Sarees are priced all over the place, from 3-4k upwards. Depending upon the work, style heaviness of the garment…you can find all your trousseau needs satisfied by this one store. In one line this is basically a (under 30k) store where all your prewedding needs can be dealt with. Does Zari Jaipur have Bridal Lehengas? Yes they do. Their range of bridal wear starts from 25k upwards. I still haven’t seen the collection as it is kept in a different store. But I will update all of you the minute I see their collection. The flagship store is located in Jaipur which is a 5 floor building catering to all things weddings. UDAIPUR STORE: Rkay Mall, 48, Panchwati, Shop No. 5 & 6, Manak Chowk, City Palace, Udaipur 313001. INDORE STORE: 13/1, Lakshya Badgara Crest, Near Corporation Bank, New Palasia, Indore – 452001. BILASPUR STORE:Shop No. 5, Ground Floor, City Mall 36, Mangala Chowk, Bilaspur, C.G. All the pictures you see in this post are from the Gurgaon Zari Jaipur store. I completely understand your apprehensions. Let me do some research and will let you all the options available in Mumbai. Don’t worry, you are going to look beautiful on your wedding day.